Of all the minerals your body contains, calcium is the most abundant. It is essential for many bodily processes, including healthy hair growth. Many Americans do not meet the RDA for this mineral, and if your calcium levels are low, you may experience hair loss, among other side effects. Talk to your doctor about adding more calcium-rich foods, or even a supplement, to your diet, and also tell her about your hair loss. While 99 percent of the calcium in your body is located in your teeth and bones, a portion of it can be found in the cells of your hair follicles. The calcium in your hair helps to stimulate communication between cells, thereby promoting hair growth and healthy follicles. This mineral also keeps your heart, muscles, nerves and various other systems functioning, and all of these processes play a vital role in healthy hair growth. 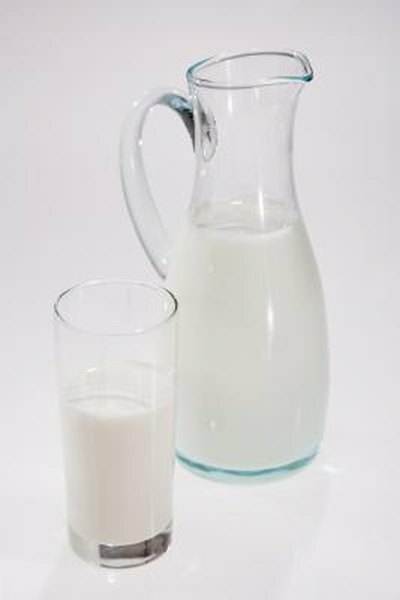 Many foods in the United States naturally contain or are fortified with calcium, but you may still not be getting enough in your diet. Those at a particular risk for a deficiency and its accompanying side effects include postmenopausal women, those who are on corticosteroids and people who drink large amounts of alcohol, soda or other caffeinated beverages. Along with hair loss, a calcium deficiency can result in the development of osteoporosis, which is a weakening of your bone tissues. Adults between the ages of 19 and 50 need 1,000 mg of calcium each day, but if you are over 51, you should get at least 1,200 mg a day. The best food sources of this mineral include cheese, milk, yogurt, tofu and blackstrap molasses. Cabbage, kelp, dried figs, hazelnuts, oysters and sardines are good sources as well. If you do not eat dairy products or are otherwise unable to meet the RDA for calcium through diet, you may need to take a supplement to keep your levels up. Talk to your doctor about the amount and type you should consume. Your body needs additional nutrients to utilize calcium, including magnesium, phosphorous, vitamin D and vitamin K. These nutrients are also essential for healthy hair growth, and you should talk to your doctor about your consumption of these as well. If you experience hair loss, seek medical attention to determine the cause, as well as decide on subsequent treatments. Also be aware that high doses of calcium can result in vomiting, kidney toxicity, frequent urination and an irregular heartbeat, and you should not exceed the RDA without first consulting with your doctor.